Hawaii Native Status: Introduced. This naturalized food plant is native to Florida, Mexico, and Central and South America. Description: The flowers emerge from the leaf axils and have 5 white, fleshy, waxy lobes. The plants are sexually variable and can be dioecious (male and female flowers on separate plants), monoecious (male and female flowers on the same plant), or hermaphroditic (having bisexual or "perfect" flowers). 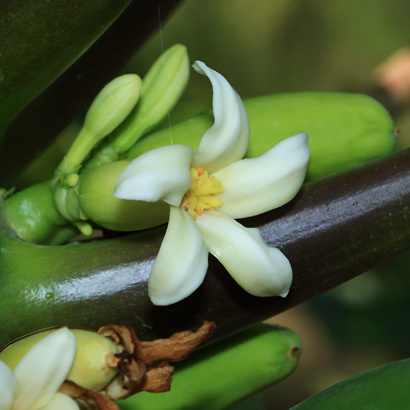 The female and hermaphrodite flowers are followed by anywhere from 2 to 20 inch (5 to 50 cm) long, round, pear-shaped, or club-shaped, green ripening to yellow, orange, or red-tinged, melon-like fruits with yellow, orange, or salmon-colored flesh and a cavity containing a gelatinous mass of black seeds. The leaves have long, hollow petioles (stalks) and are green, clustered at the stem tips, and deeply palmately lobed with 5 to 9 main lobes that are themselves pinnately lobed. The main stem is slender, upright, and marked with conspicuous leaf base scars. 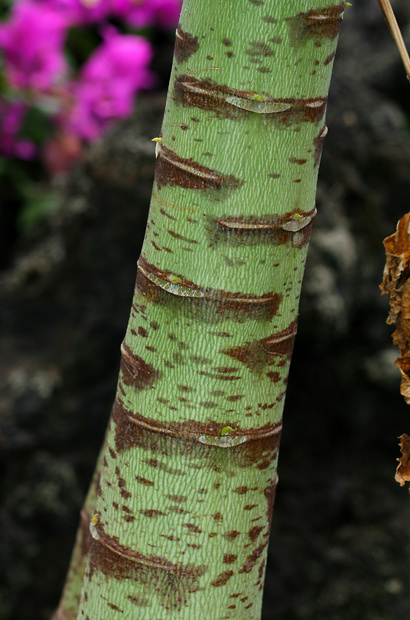 The stems on young plants are green and dark purple, while those of older plants are brown and woody. The foliage and the unripe fruits will ooze milky white latex if cut. 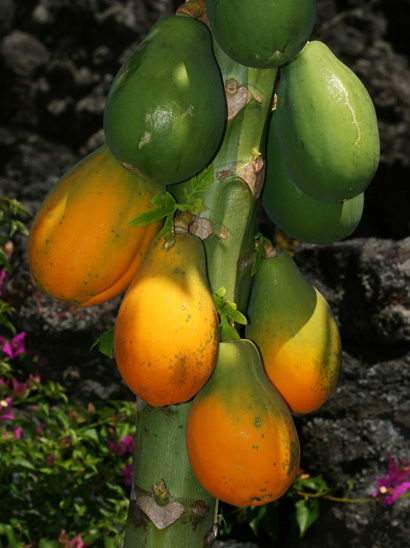 Here in Hawaii, Papayas are grown commercially for their fruit, but they have also become naturalized in lowland areas. The plants are grown from seed and are very fast-growing. Edible – The sweet, juicy flesh of the ripe fruits is edible either raw or cooked. The fruits continue to ripen after picking. 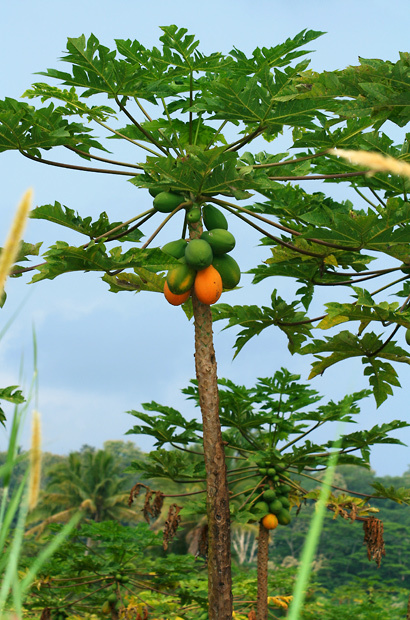 This is the familiar Papaya sold in stores and used in a wide variety of prepared foods. Green Papaya is edible if cooked. Papain, an enzyme used as a meat tenderizer, is extracted from the dried milky sap.